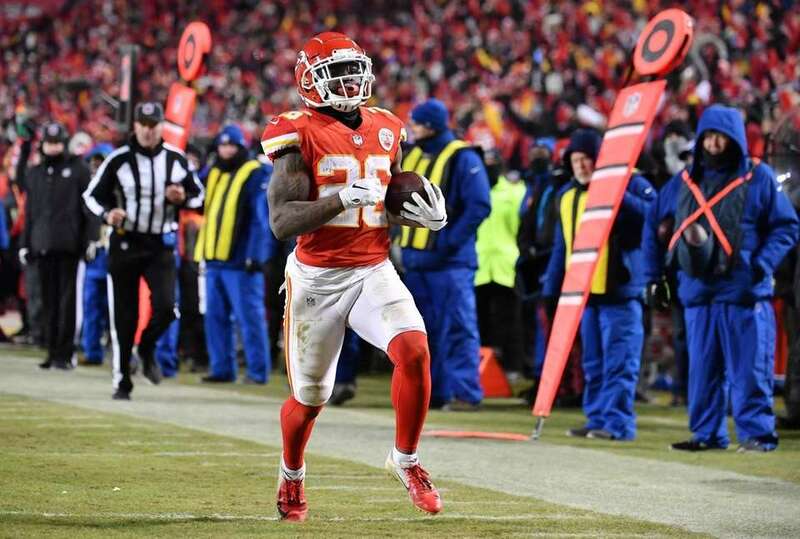 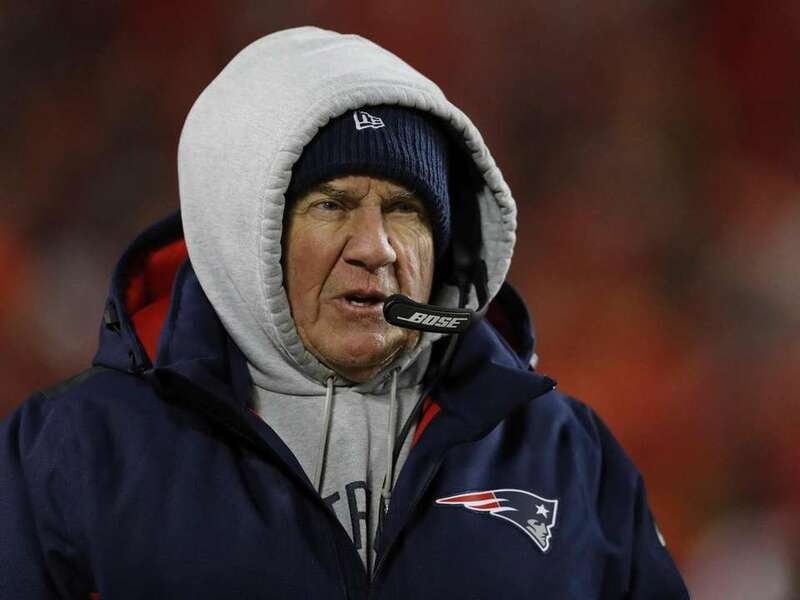 The Kansas City Chiefs host the New England Patriots in the AFC Championship Game on Sunday at Arrowhead Stadium in Kansas City. 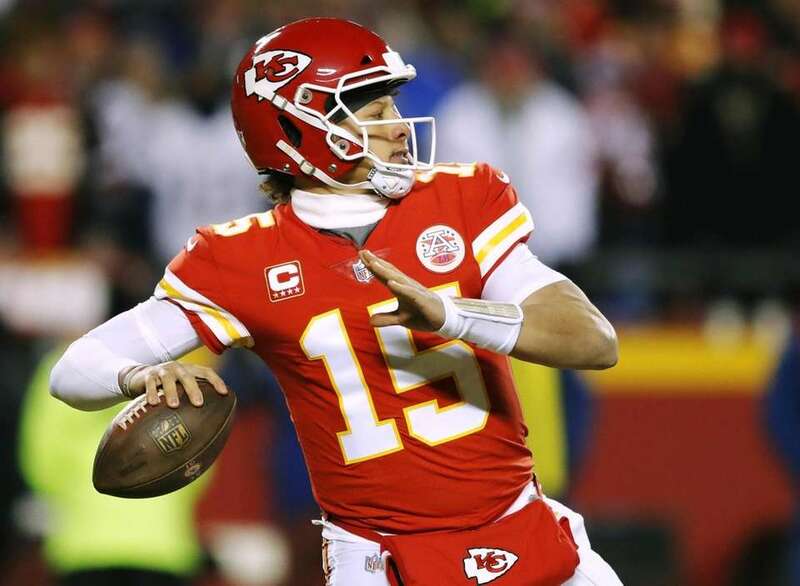 Kansas City Chiefs quarterback Patrick Mahomes throws a pass during the first half of the AFC Championship NFL football game against the New England Patriots, Sunday, Jan. 20, 2019, in Kansas City, Mo. 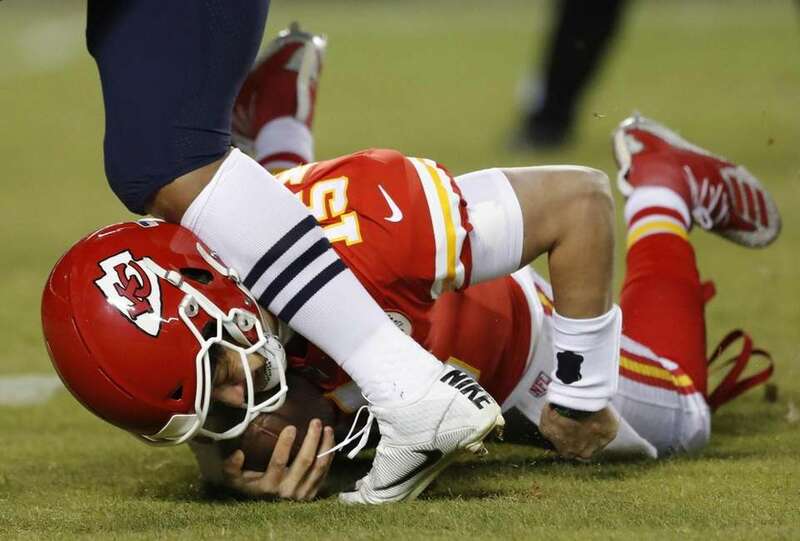 New England Patriots middle linebacker Kyle Van Noy (53) sacks Kansas City Chiefs quarterback Patrick Mahomes (15) during the first half of the AFC Championship NFL football game, Sunday, Jan. 20, 2019, in Kansas City, Mo. 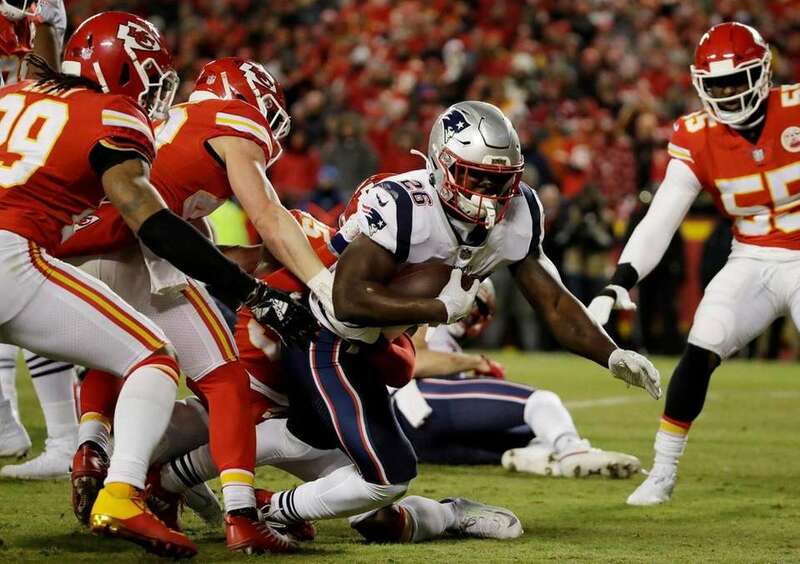 New England Patriots running back Sony Michel (26) runs against New England Patriots defense during the first half of the AFC Championship NFL football game, Sunday, Jan. 20, 2019, in Kansas City, Mo. 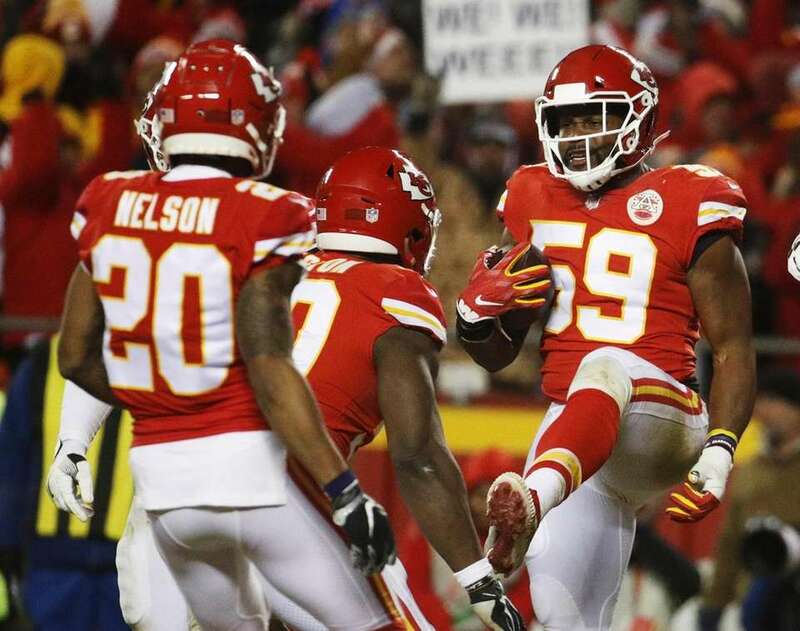 Kansas City Chiefs inside linebacker Reggie Ragland (59) celebrates after intercepting a pass during the first half of the AFC Championship NFL football game against the New England Patriots, Sunday, Jan. 20, 2019, in Kansas City, Mo. 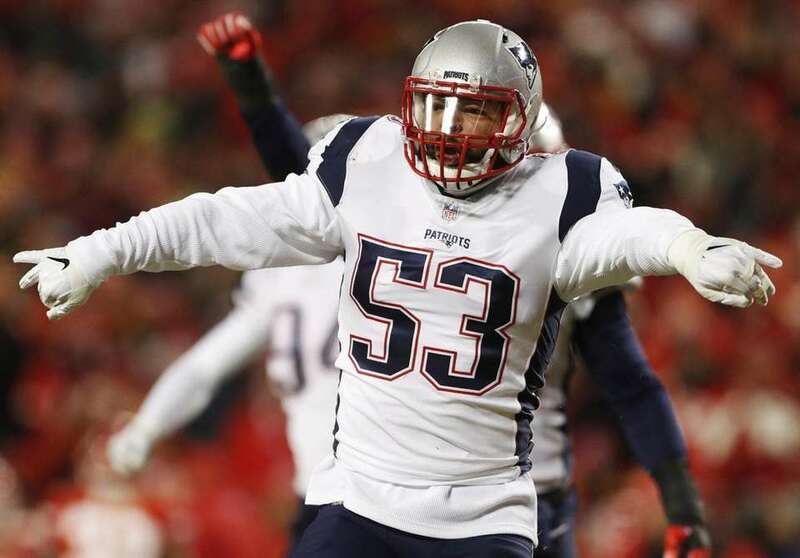 New England Patriots middle linebacker Kyle Van Noy (53) celebrates after sacking Kansas City Chiefs quarterback Patrick Mahomes during the first half of the AFC Championship NFL football game, Sunday, Jan. 20, 2019, in Kansas City, Mo. 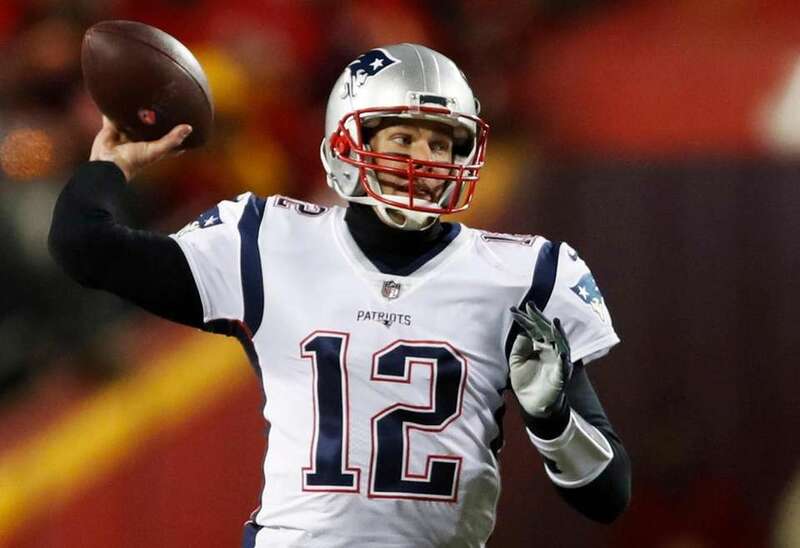 New England Patriots quarterback Tom Brady (12) throws a pass during the first half of the AFC Championship NFL football game against the Kansas City Chiefs, Sunday, Jan. 20, 2019, in Kansas City, Mo. 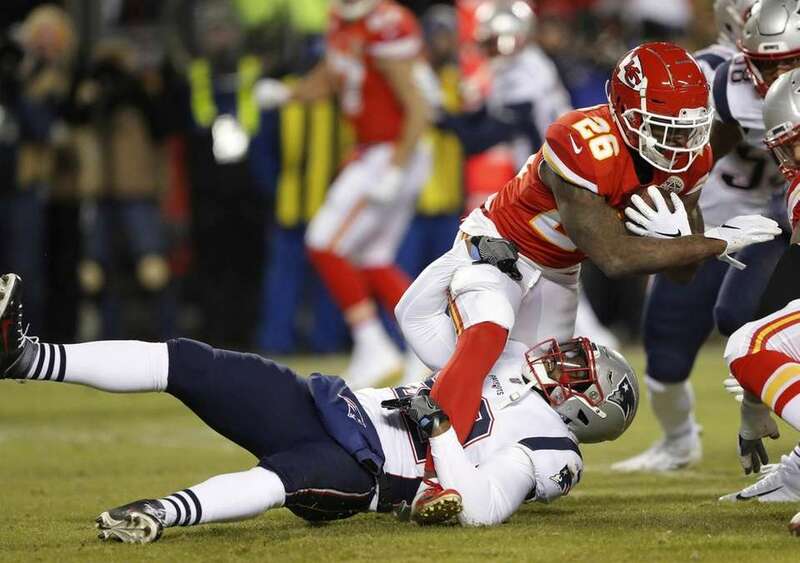 Kansas City Chiefs running back Damien Williams (26) is tackled by New England Patriots outside linebacker Elandon Roberts (52) during the first half of the AFC Championship NFL football game, Sunday, Jan. 20, 2019, in Kansas City, Mo. 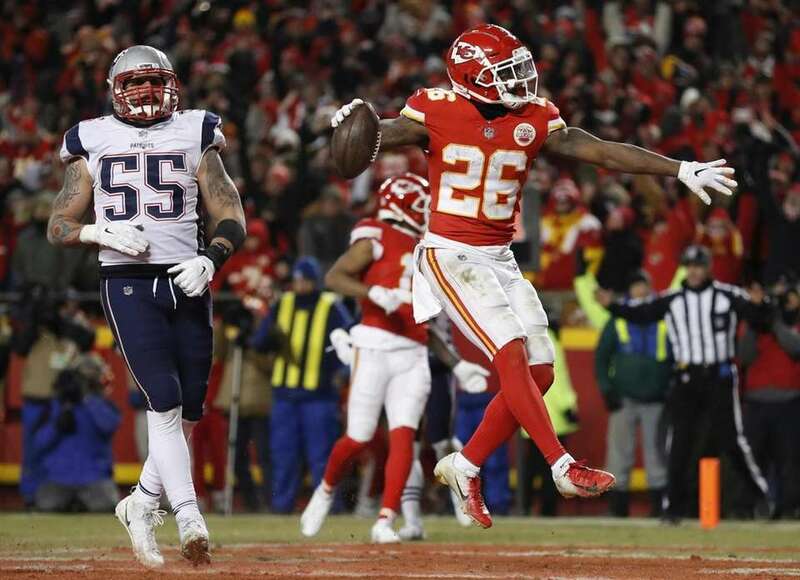 New England Patriots running back Rex Burkhead makes a catch against Kansas City Chiefs inside linebacker Anthony Hitchens (53) during the first half of the AFC Championship NFL football game, Sunday, Jan. 20, 2019, in Kansas City, Mo. 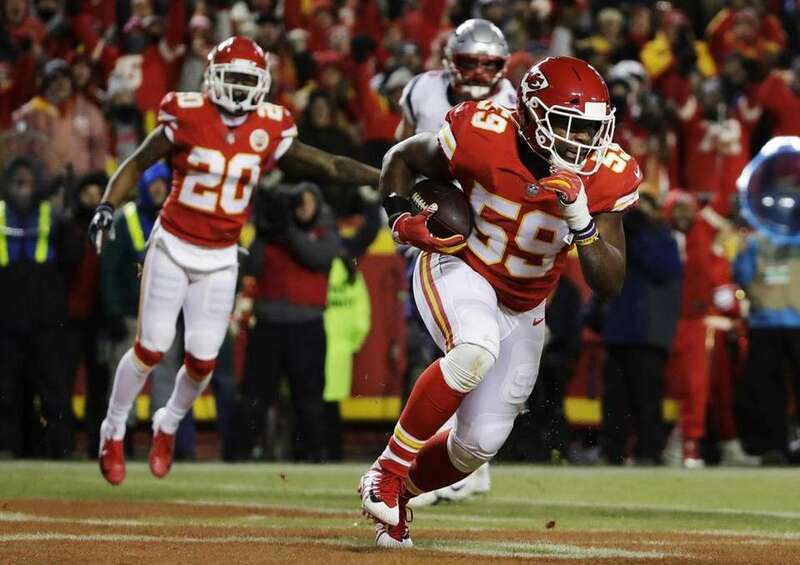 Kansas City Chiefs inside linebacker Reggie Ragland (59) runs after intercepting a pass during the first half of the AFC Championship NFL football game against the New England Patriots, Sunday, Jan. 20, 2019, in Kansas City, Mo. 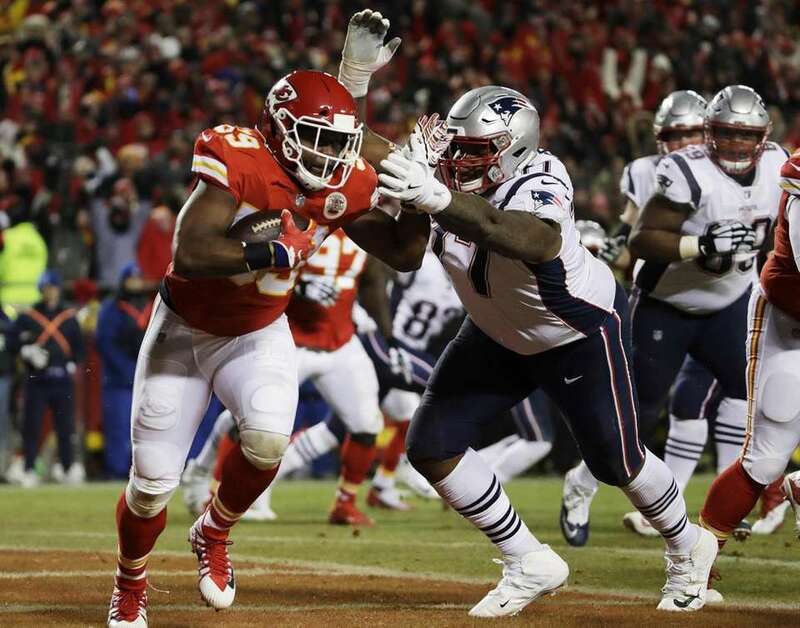 Kansas City Chiefs inside linebacker Reggie Ragland (59) runs against New England Patriots offensive tackle Trent Brown (77) after intercepting a pass during the first half of the AFC Championship NFL football game, Sunday, Jan. 20, 2019, in Kansas City, Mo. 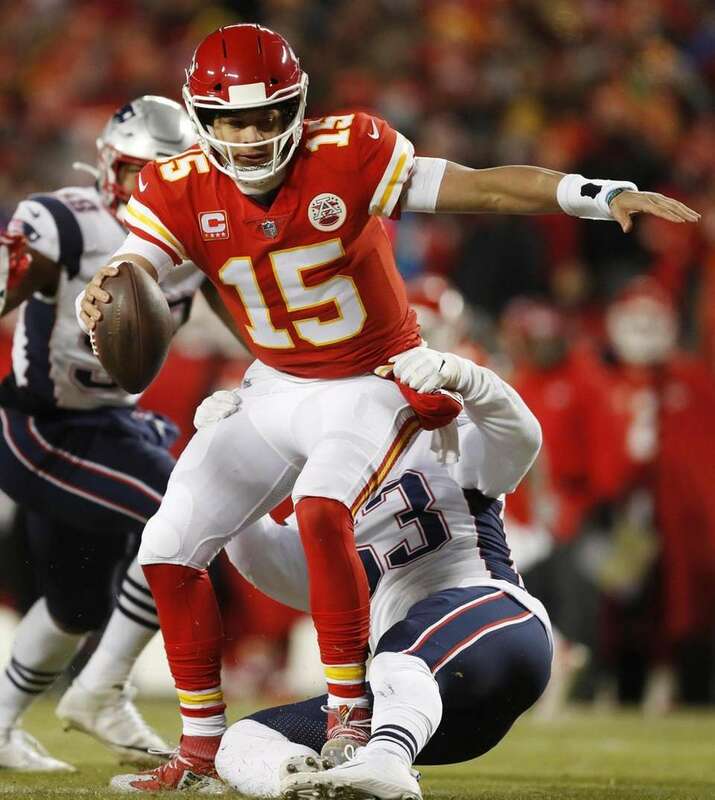 A player runs into Kansas City Chiefs quarterback Patrick Mahomes (15) after Mahomes was sacked by New England Patriots middle linebacker Kyle Van Noy during the first half of the AFC Championship NFL football game, Sunday, Jan. 20, 2019, in Kansas City, Mo. 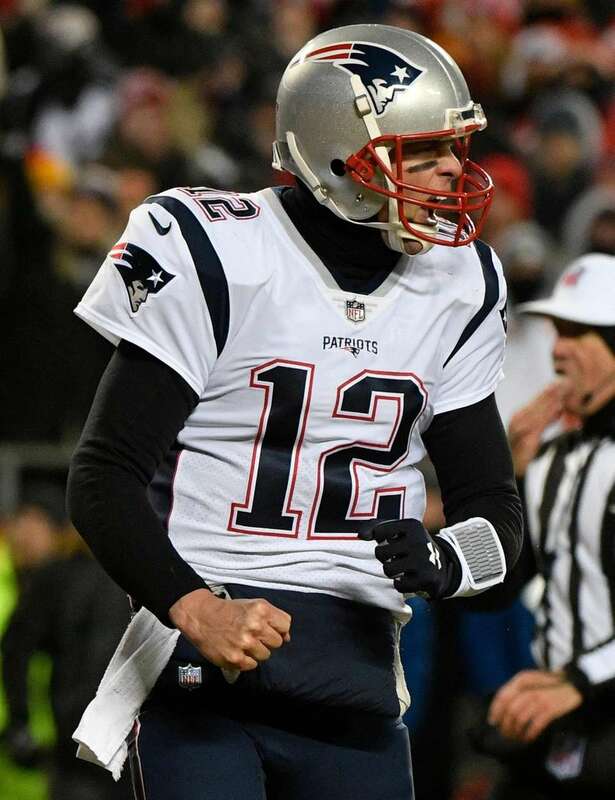 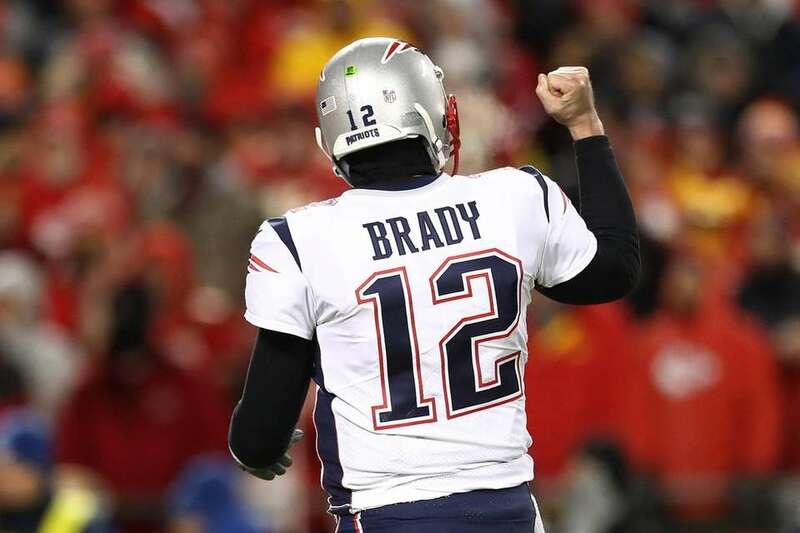 New England Patriots quarterback Tom Brady reacts after a touchdown pass against the Kansas City Chiefs during the first half of the AFC Championship at Arrowhead Stadium in Kansas City on January 20, 2019. 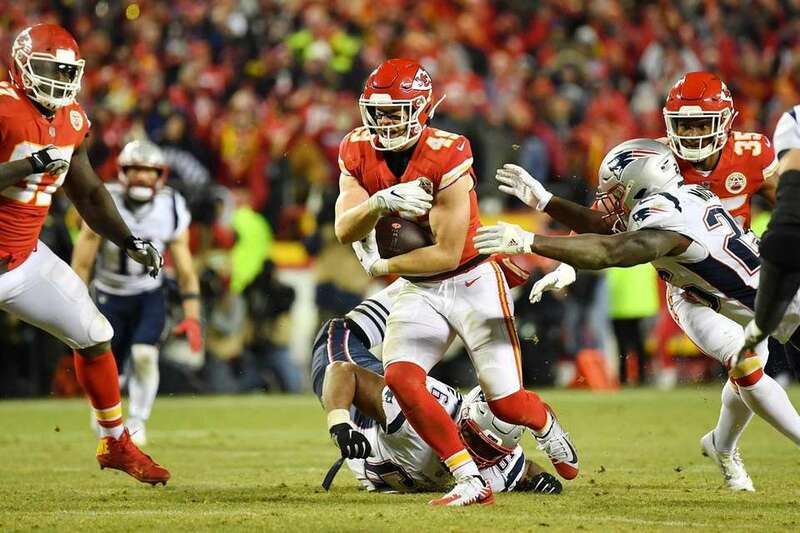 Daniel Sorensen #49 of the Kansas City Chiefs runs with the ball after intercepting a pass in the fourth quarter against the New England Patriots during the AFC Championship Game at Arrowhead Stadium on January 20, 2019 in Kansas City, Missouri. 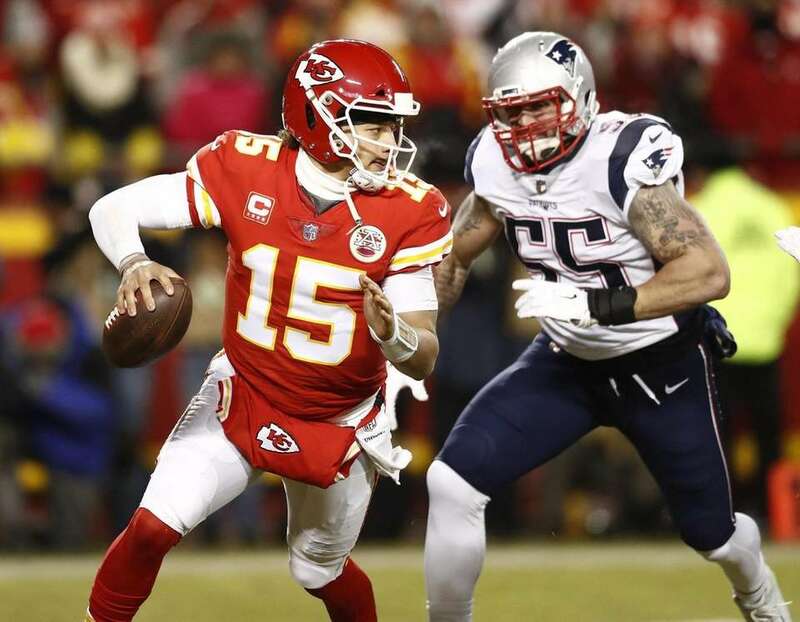 Kansas City Chiefs quarterback Patrick Mahomes (L) scrambles away from New England Patriots outside linebacker John Simon (R) during the first half of the AFC Championship at Arrowhead Stadium in Kansas City on January 20, 2019. 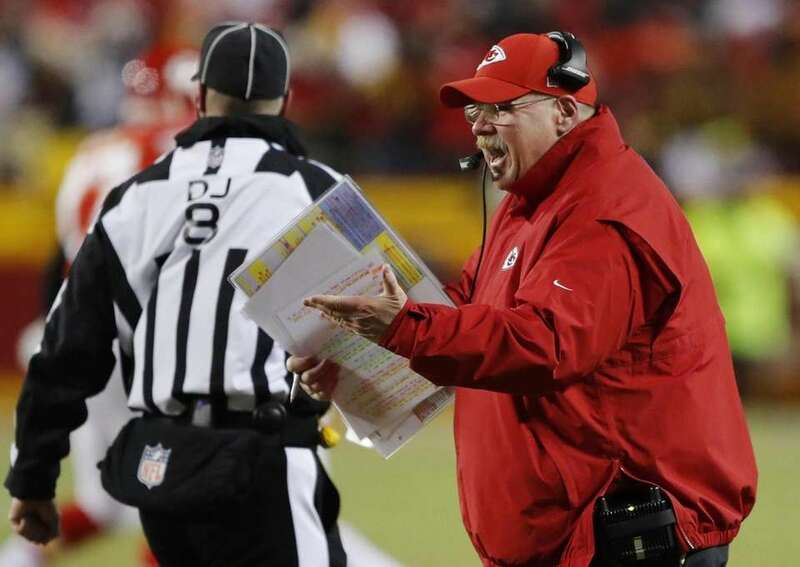 Kansas City Chiefs head coach Andy Reid argues a call during the second half of the AFC Championship NFL football game against the New England Patriots, Sunday, Jan. 20, 2019, in Kansas City, Mo.